The upcoming TV season will bring more sitcom nostalgia in the "Roseanne" and "Will & Grace" mode. More heartwarming dramas taking a circle-of-life page from "This Is Us." More crime and medical dramas in which the good guys always win, and in just an hour (minus commercial time). As once-mighty broadcast ratings continue to be shredded by media alternatives, the networks are going where viewers are pointing them. That means family-friendly shows in the reality genre as well as scripted: Say "awwww" for "Dancing With the Stars: Juniors," a kiddie version of the original. While networks have tried before to compete with the daring fare of the likes of HBO, FX, Hulu or Netflix, the 2018-19 season won't see much of that. It's "good news for broadcast" that households gather to watch its shows, ABC Entertainment President Channing Dungey said this week. Amen, said CBS Corp. CEO Leslie Moonves, who lauded broadcasting as the "big tent" that brings America together. Here are details on some upcoming series and the trends behind them. Roseanne Barr's support for President Donald Trump was a conspicuous part of her character when "Roseanne" returned, but politics are a poor fit with broadcasting's wide-net approach. To that end, ABC and NBC are tamping down anticipation that "Roseanne" or "Last Man Standing," another show with an openly partisan star in Tim Allen, will be soapboxes. "Tim's personal politics really aren't a big feature of the show, and I think that if you were to talk to Tim and our (producers), they would say Mike Baxter is a centrist," Gary Newman, chairman of Fox Television Group, said of Allen's character. 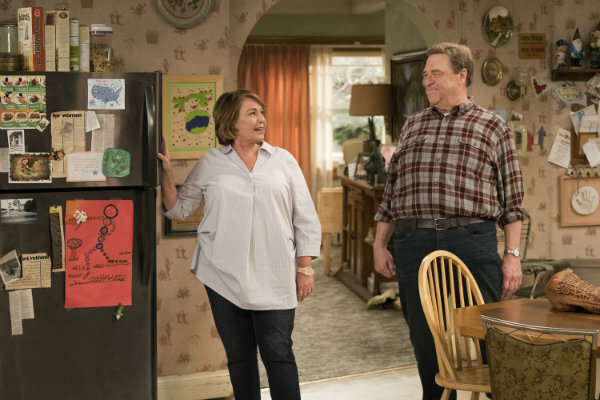 As for "Roseanne," the show is headed "away from politics and more focused on family," said Dungey. There's a likely dissenter: "Murphy Brown," back on CBS with Candice Bergen in the lead role of a TV journalist. In promotions, CBS recalls how the original series took on thorny political and social issues, including abortion, suggesting it would again. Talking up the show to advertisers, Bergen cracked a Fox News Channel joke. And don't count out Barr's show. "The press has misrepresented what ABC President said about our new season," she tweeted. The success of "This Is Us" served as a reminder that there's more to life than comic book heroes and crimebusters — there's the real world, as in love, marriage, child-rearing and struggle. That's prompted a deep emotional response from the TV industry: Trend! CBS' "God Friended Me" stars Brandon Micheal Hall as a radio host who espouses atheism. Then, just as the title says, he gets a social media friend request from God that turns him into an "agent of change," as the network put it. Think "Touched by an Angel" with a dash of "This Is Us." ABC's "A Million Little Things" is about a group of friends who get a "wake-up call" to embrace life after one pal dies. Along the way, ABC said, "they discover that friends may be the one thing to save them from themselves." Think "The Big Chill" with a hint of "This Is Us." NBC, home of "This Is Us," won't be left out. Newcomer "The Village" is "a heartwarming ensemble drama set in a Brooklyn apartment building where the residents have built a bonded family of friends and neighbors." Think "Friends," presumably minus the laughs, and "This Is Us." Everything old is new again, including sitcoms and how they're produced. The multiple-camera, aka "multi-cam," format that became popular in the 1950s with "I Love Lucy" has been steadily overtaken by comedies shot more like films and without a studio audience. But sitcom revivals — complete with their original casts and original multi-cam approach — has given new life to the format, heartily reaffirming laugh tracks included. Fox jumped on the bandwagon with newcomer "The Cool Kids" and second-chance "Last Man Standing," the Tim Allen show dropped last year by ABC. They'll be paired on Friday night in hopes of drawing viewers who watched Fox's new Thursday NFL games, a Fox executive suggested. It didn't seem like the smart move to air "highly serialized comedies" that might keep new viewers from dipping in and out, said Dana Walden, CEO of Fox Television Group. Interpretation: multi-cam shows have more jokes and less character nuance than, say, "Modern Family." Even NBC, which network Entertainment Chairman Robert Greenblatt labeled a "more single-cam" network, is launching multi-cam sitcom "Abby's." The new twist: It's taped outside.